The Cedar Grove Saints bounced back from a season opening loss to Stephenson to snap the defending Trail to the Title champions Tucker Tigers’ regular season win streak at 31 games with a 16-8 middle school football victory at Godfrey Stadium on Saturday. 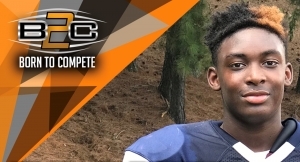 Cedar Grove’s Barry Jackson was named Born to Compete’s (B2C) Player of the Week (8th Grade Division) after scoring two touchdowns (1 receiving, 1 rushing) and making a big fourth down stop out of his linebacker spot on defense to secure the Saints’ big win. Naeshawn Parsons helped set up Jackson’s touchdowns with key runs in the two touchdown drives for the Saints (1-1). Tucker fell to 1-1 on the season as the teams head into region play this weekend. Cedar Grove’s win vaulted them into the B2C Prime 21 rankings at No. 20. Tucker fell from No. 1 to No. 8. A big play explosion by the Bethune Lions spoiled the Miller Grove Wolverines’ season opener in a 38-0 win at Avondale Stadium on Saturday. Bernard Mack (85 yards rushing) led the Lions (2-0) big strike scores with a 75-yard kickoff return for a touchdown and a 60-yard touchdown reception from quarterback Isaiah Logan (5-10, 180 yards, 3 TDs). Ventrillo Dunlap (45 yards rushing) was on the receiving end of a 50-yard touchdown pass play from Logan and Letrelle Richardson put together a 60-yard touchdown reception. Kenyon Partridge added a three-yard touchdown catch. The defense was led by Brandon Underwood who had 9 tackles including a sack and forced a fumble for Bethune. Dunlap added 5 tackles on defense while Josh Peterson had 4 tackles and Phillip Blalock 4 tackles and fumble recovery. Dezikiah James (2 tackles) and Zandarious Washington both had sacks in the game. Quinterio Lawson and Deandre Lampkin both scored touchdowns as the Stephenson Jaguars knocked off Chapel Hill 14-0 in a hard-fought matchup of 2017 Trail to the Title playoff teams at Hallford Stadium on Saturday. Tymere Burton added a safety for the Jaguars (2-0). Chapel Hill fell to 1-1 on the season. The Jaguars climbed to No. 2 in the B2C Prime 21 Eight Grade rankings. The Lithonia Bulldogs remained undefeated after two weeks of play as they got past the Columbia Eagles 12-8 on Saturday at Avondale Stadium. Renardo Eubanks 65-yard touchdown run was the key play in the win for the Bulldogs. Columbia’s Rowland Edwin returned a fumble for 60 yards and a touchdown as the Eagles fell to 1-1 on the season. The McNair Mustangs are one of five undefeated DCSD middle school football teams following a 20-8 victory over the Salem Lions on Saturday at Godfrey Stadium. Kadarius Bailey played a big role in the victory with a punt return for a touchdown and adding another running the football for McNair (2-0). Royce Tolbert added a rushing touchdown of his own for the Mustangs. Salem fell to 0-2 on the season. The Champion Chargers evened their record at 1-1 on the season with a 26-0 shutout win over the Freedom Rams at Hallford Stadium on Saturday. A 20-point, second quarter outburst by the Chargers helped put the game away. Andrew Perry’s four-yard touchdown run opened the scoring for Champion against the Freedom (1-1) defense. Milton Smith recovered a fumble forced by Cameron Ferguson and returned it for a touchdown and Darrius Owns added a touchdown run. Jacob Moore rushed for over 100 yards and a touchdown in the game for Champion. Xavian Green and Antonio Molder both rushed for over 100 yards to lead the Raiders (1-1) to a 42-0 shutout of the Peachtree Patriots on Saturday at North DeKalb Stadium. Green put together 158 yards and two touchdowns on eight carries and Molder went for 102 yards and a touchdown on nine carries for the Raiders. Caron Polk had just 37 yards rushing on two carries, but both run resulted in touchdowns. The defensive shutout was led by Anthony Randolph (6 tackles, 2 sacks, 2 fumble recoveries) and Adrian Walker (7 tackles, 1 interception). In other scores Henderson (2-0) remained undefeated with a 30-0 win over Stone Mountain (0-2) and Renfroe (1-1) rolled past Sequoyah (0-2) 56-0.